Bridges for Peace is a program designed to promote peace and dialogue between Jewish and Arab students in Israel. The question of hot to achieve peace between Jews and Arabs is not one that can be easily searched on Google. The mammoth search engine company, however – along with the Israel Sci-Tech Schools network and the Peres Center for Peace – is trying to offer its own answer through Bridges for Peace, a technology program designed to promote peace and dialogue between Jewish and Arab students in Israel. 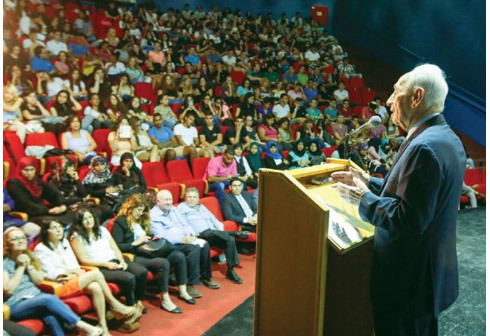 Former president Shimon Peres announced that he is leading a move to make the program a large-scale national initiative that reaches thousands of students across the country. “To get a true coexistence within Israel and break down barriers, we need to bring science and technology to everyone, Jews and Arabs,” stated Peres in a press release Tuesday. Since its inception in 2013, more than 500 students across the country have taken part in the program through Israel Sci-Tech Schools, the largest independent network of educational charter schools in the country. Through multicultural Google+ circles, students from 14 schools in different geographical communities are paired together to get to know one another online. The program has seen students from Ebin Sci-Tech Comprehensive High School in Ramat Gan working with students from the ORT Hilmi Shafi School in Acre, and peers of the ORT Umm Batin School in the Negev working with students from the ORT Ronson High School in Ashkelon. The students work on joint projects, first through online meetings, and then face-to-face. “The Bridges for Peace program has shown significant success, much like all of our campaigns with Israel Sci-Tech Schools,” said Google director of policy & government relations in the Middle East Doron Avni. “Israel Sci-Tech Schools is delighted to be working with Google and the Peres Center to educate students in science and technology, and beyond that to use education as a tool to promote peace and understanding among our students,” said Israel Sci-Tech Schools director-general Zvi Peleg in a press release.